Sorry for the delay in posting--I went out of town unexpectedly last weekend, and of course it put me behind all this week. It was a good trip, though, in many ways. For one thing, I got to see Jane! We were headed in perpendicular directions, so we met up for dinner and catching up along the way. Pattern: Travelling Roses by Leanne Cooper. Needles: Takumi No. 1 US (2.25 mm). Yarn: Diana (90% merino, 10% silk) from Posh Yarn. The Diana is wonderful stuff. It knits up into a warm, soft fabric with just a little sheen to it. It looks so dark against the snow, but in sunlight you wouldn't even know it's the same scarf. I desperately need some blocking wires--I estimate, conservatively, that there are about 250 pins in this thing. Blocked, it's about 60" long and 7" wide, which is a little smaller than Leanne's (66x8). I probably could have blocked it a little more severely along the width, but I didn't want to break any threads. Next time: finished scraf (as K would say)! At long last, I am home again. Everything seems to be as before, and it's frickin' freezing outside . . . hooray? 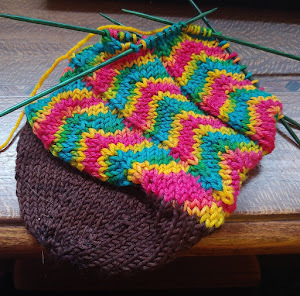 Work on the second toe-up sock continues, as does work on the North Star mittens. In this weather, mittens are top priority. I'm about half-done with the first, but they're quick to knit up. In the meantime, I leave you with . . . kitteh pictures! Now that everyone has recovered from drunken debauch (or in my case, back-to-back Batman movies), on to the knitting. I finished the first of the toe-up Regia socks the other night and went to cast on the second. I had forgotten to copy the pattern before leaving home, but I was pretty sure I remembered how to do it. Erm. Well. I got it cast on, no problem, but when it came to the increases, I could not for the life of me remember where they went. I tried two different configurations, getting more and more frustrated all the time. At length, K asked me what the problem was and how we could fix it. "Tomorrow, find a bookstore and look it up," I said. "Is it on Amazon maybe?" he asked. The man is a genius, I say, a genius. Thanks to the magic of the internet, I was able to find the exact page and get my decreases perfect. The second sock has been launched! Of course, now that it's well-established, I'm ignoring it to work on Travelling Roses. I'm determined to finish it by the time I'm home.